Availability:Usually ships the next business day. "That is such a forgiving time. When that first cold, bright streak comes over the water, it's as if all our sins were pardoned; as if the sky leaned over the earth and kissed it and gave it absolution." Willa Cather. The Chukchi Peoples have lived on the most northern and eastern part of Russia [bordering the Bering Sea] for at least 5000 years. They were always a maritime people and show evidence that they have always been avid traders. On the coast of Chukotka we saw unearthed a striking 2000 year old Fossil Ivory and bead Amulet worn to celebrate the sun's first appearance on the horizon signaling the end of the long winter and the beginning of easier times. All the peoples of the northern Bering Sea area had the same ritual of celebration for this day: They flipped back their parka hoods, threw off their gloves, smiled and clapped their hands to insure a full year of good luck! Like the original Fossil Ivory, this Amulet's sun sprays its sunlight in natural rays. 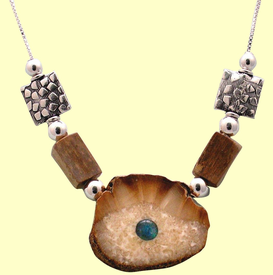 We added a beautiful blue/green opal for the sun, two rectangular Fossil Mammoth Ivory Beads, as well as two unusual square embossed sterling silver beads. All are separated by small round sterling silver beads. We replaced the original leather neck loop with a sterling silver chain to mix modern elegance with primitive power. Wear it anywhere! The central ray pattern Fossil Walrus Ivory is 1 inch high and 1 1/4 inches wide. You, too, will want to clap your hands and look forward to happy times whenever you wear this piece! Of course, completely hand-crafted in our studio. Comes on Sterling Silver chain.